EDITOR’S NOTE: The following is a guest blog post by Chris Hull, Board Director & Communications Advisor for Special Olympics Great Britain. Well that’s a wrap for another World Games. Needless to say, Special Olympics Great Britain athletes – along with 7,000 of their peers – have excelled with a magnificent set of performances. 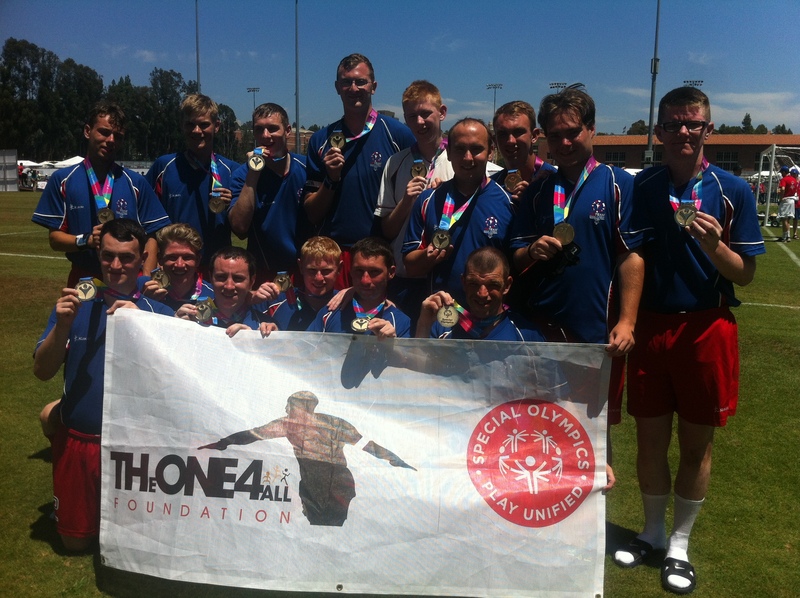 Nearly 200 medals are flying back over the pond to England, Scotland and Wales – including a set of Unified Football players with silver adorned around their necks. These young men bonded like you could not imagine in such a short space of time. They acted as great ambassadors for their country. Perfect role models. These qualities were forged out of the Unified Sports programme, pioneered, promoted and championed by Special Olympics across the globe. It joins people with and without intellectual disabilities on the same team. The principle is that by training together and playing together, it is a quick path to inclusivity, friendship and understanding. On 2 August, we witnessed the Special Olympics World Games Closing Ceremony at the Los Angeles Memorial Coliseum where there was plenty of emotion, memories and friendships cemented for a lifetime within the #TEAMSOGB Unified footballers but also created with 177 other countries across humanity and planet Earth. They said farewell to each other, knowing that they have contributed to a sea of unity, competition, thrilling sporting action, joy, courage and comradeship. However, those bonds are now there for life. Unbreakable. Around the world, families and friends of our athletes will never forget what their children and loved ones have achieved against the expectation of many. The spirit of sport has been in evidence every single day here in Los Angeles at these World Games and Special Olympics Unified Football has exemplified that goodness. Of course, every athlete was striving for a gold medal, but the class and grace of all athletes – regardless of their result – was an example to everyone. The qualities of sportsmanship and respect in victory or defeat were omnipotent, important life lessons. #TEAMSOGB’s Unified players took defeat on the chin in the Final, shook the hands with the Austrian gold medallists and – despite wanting that top accolade – inside they were happy for their opposition, knowing the joy and elation the Austrian players were feeling. Although the boys lost 2-0 in the Gold medal Final against a resolute Austria – we are so proud of these lads. The Austrian goalkeeper was saving them with all parts – including his face! The World Games have given what all people with intellectual and learning disabilities require in life – a chance. Special Olympics Great Britain gives people with intellectual disabilities an opportunity to thrive, strive and feel alive every day, through sport, every week, across our country. There is no turning back. Unified Football and Unified Sports will play a pivotal role in our movement, momentum and journey toward inclusion for all. The President is spot on. Our athletes are an example not only to their peers but society as a whole. They see obstacles and challenges. They face them straight on. Then overcome them. Let’s build on this momentum every day in every community around the world, side by side with our friends who need our support the most. It’s a privilege as officials, volunteers and coaches to serve these wonderfully gifted people. If we let them in, without a shadow of doubt, they can bring us joyous change and improve the World. WATCH: An emotional #TEAMSOGB coach Scott, supporter Audley Harrison, James and the players show their class in this video. Top performance from a group of fine young men.